Chinese New Year is less than a month away. It is time to do some shopping for new clothes to welcome the new year ahead. It had always been tough to choose the clothes for the boys given the myriad of choices in Singapore. Thanks to Poney Singapore, this year will be a breeze as we will be embarking on a shopping spree for our Chinese New Year outfits. Located at The Shoppes @ Marina Bay Sands, this is Poney's flagship store comprising of Baby Poney, Poney Toddlers, Poney Kids and its premium brand Poney Enfants. This is one place where you can shop for causal chic to formal flair for age 0-12. Our 'mission' today is to find Chinese New Year clothes. So it is no surprise we zoom in Poney's CNY collection that is splash in dashes of red. Given our age AND Size, Poney would be best suited for us. Featuring clothes that are chic and trendy, the range is suited for daily wear as well as parties and functions. We love the Poney logo that made the clothes distinctively recognizable. The collection features a generous shades of red in its outfits. From Polo Tees with Red accents to red checked long sleeve shirts, you are sure to find a hip combination that will suit Chinese New Year. After a few fittings, we decided on the following outfits for the boys. Say bye bye to one tone shirts. The shirts at Poney are multi-tone and multi texture with impressive detailing that gives the shirts a upscale look and feel. The Poplin short sleeve shirt materials and colour contrast is simply outstanding. The dark red hues compliments the dark blue tones perfectly. The brown suede trousers is unique and detailed with patterns on the pockets. This is one outfit that I would love to wear for myself... if they have my size. Talking about sizes, the fittings for the kids are about right. There are some other brands that require 2 or 3 sizes bigger for the recommended age group.With Poney, it is a perfect fit for the boys. The long sleeve red and blue check shirt can be folded and tied to the sleeve via a demin blue strip. The demin blue strip is also on the collar for added contrast. The all white bermudas is comfortable with a distinct red Poney logo at the side. A perfect mix for a bright CNY look. Everyone knows that CNY celebration last more than one day. Sometimes it can take weeks to complete the visits to relatives and friends. That can only mean one more thing... You need more than one set of new clothes! The boys selected their second set and decided to be decked in summer greens. After all we are in Sunny Singapore where Summer is 365 days a year. This is the perfect look for the local lads. The green tops selected were nicely detailed with contrasting materials for pockets and collars. Poney is a unisex brands. Along with its colourful collection for lads, they have an equally charming collection for the little miss. From dresses to tops to jackets, it will be a perfect place to source your CNY needs for the girls. With 3 sections ranging from Baby Poney, Poney Toddler and Poney Kids, you will be spoilt for choices. Add in Poney Enfants to the mix and your child is all set be a fashionista . Let us give you a peek at Baby Poney and Poney Enfants. Babies are not left out with their own collection. Some of the collection are similar to the main collection for kids while others are exclusive to the range. Personally, we think the simple white Tee and Red shorts is a comfy choice for toddlers for CNY. Poney Enfants is a high end luxury wear for kids. 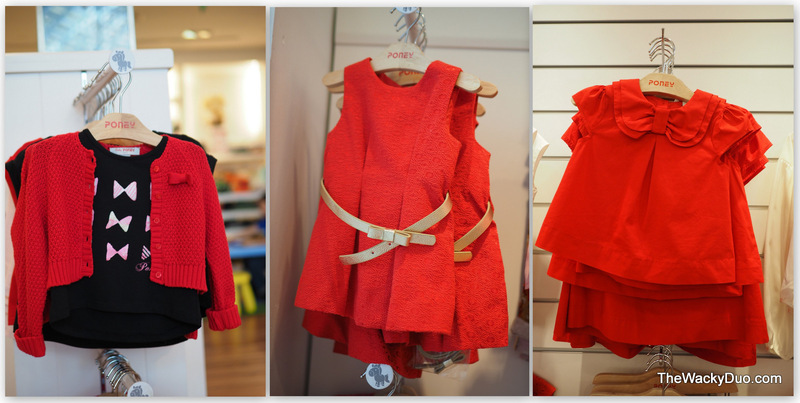 Designed exclusively in Spain by Magda Sola, Poney Enfants is luxurious , trendy and stylish for the affluent. We were expecting high end prices for these premium collection and was pleasantly surprised by its affordability. Do note while we were at the store, the sizes tend to lean towards smaller kids if you are thinking about picking CNY outfits from this range. New Outfits will also include shoes and accessories. Poney does provide this for Baby Poney range. While parents go around the shop to pick up the best outfits for the kids, the little ones can chill in a corner that is set up for them to enjoy. Thanks for Poney, we managed to snag a couple of outfits for CNY. Given its range, we would not be surprise that we will be back for more! Just check out the number of outfits we had after the shopping spree! Do look out for promotions such as sales and off season discounts. It will definitely stretch your buck in any shopping trips. Just follow Poney Singapore on facebook for updates! Giveaway opens to Facebook fans of Poney Singapore and The Wacky Duo only! Giveaway close on 31st Jan 2359. Results out on this post on 3 Feb.
Prize are subject to change and fulfillment by the sponsor. Winners are not allowed to change the prizes or exchange them for cash. Additional Terms and conditions may apply as set by Poney Singapore. Selected readers will be contacted directly by the sponsors via email provided in Rafflecopter. Winner will be contacted by the sponsor directly on prize collection details. Thank you Wacky Due for the awesome giveaway! Hope to win! !